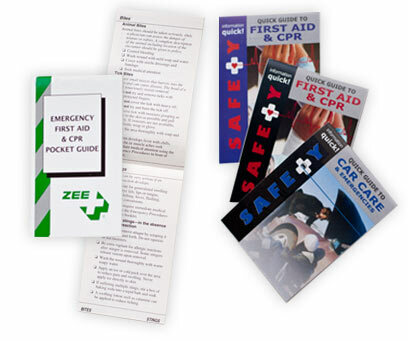 Our First Aid & CPR booklets are the most comprehensive booklets in the market. Always reader-friendly and the CPR content follows the guidelines of the Heart and Stroke Foundation. First Aid contents follow nationally recognized standards of Care. 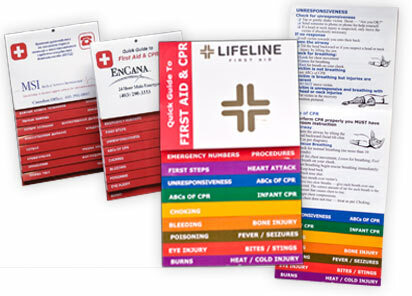 The Mini-guides to First Aid and CPR are a perfect addition to your first aid kits. Manufactured for mass production they can be privately branded either by simply adding your logo to the cover or on larger quantities, by fully custom designing the front cover. The booklet is a comprehensive quick reference guide that covers everything from emergency procedures and first steps to CPR in adults and infants. Developed with the approval of the Heart and Stroke Foundation — this guide follows nationally recognized standards of care. A perfect tool for customers or employees to keep by the phone. 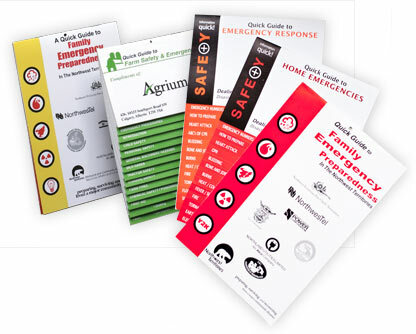 This easy-to-use and highly informative booklet shows families how to prepare and deal with potential emergency situations. It also gives instructions on first aid and CPR. Imprinted with your logo, it is a perfect way to show customers or employees that you care about their health and well being. 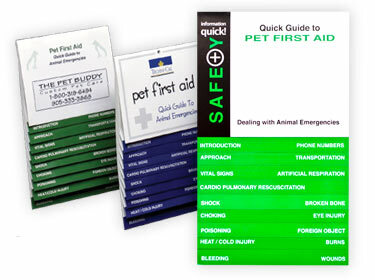 This booklet gives you basic emergency care instructions for your cat or dog. In our reader-friendly style, it gives you step-by-step instructions on how to approach an injured animal through giving CPR to your pet. Perfect for vets and clinics to use as a promotional item or to go into First Aid kits designed for animals. Are your workers sometimes exposed to nesting locations of mice? Then they may be in danger of contracting Hanta Virus — a very rare virus that is unfortunately very deadly. 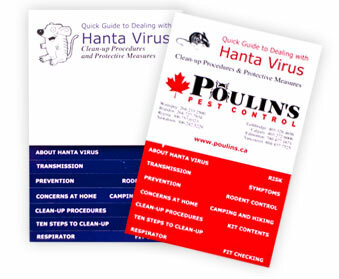 This Quick Book will identify causes, risk areas and clean-up procedures. All the information that your workers need to protect themselves is in this booklet. Workplace Hazardous Material Information System is an information system designed to ensure that workers are prepared to work safely with hazardous materials in their workplace. 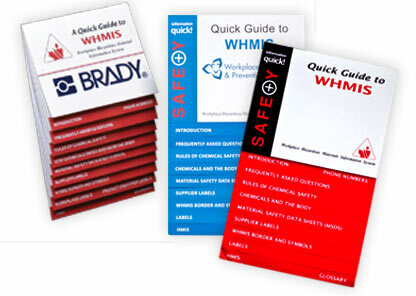 This booklet details the basic rules of chemical safety, how chemicals can harm the body, Material Safety Data Sheets (MSDS), Supplier labeling, WHMIS borders and symbols and other product identifier labels. 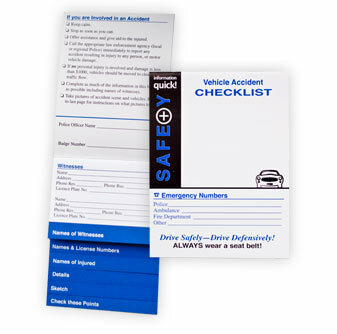 Perfect as a supplement to WHMIS training or as a safety promotion booklet customized with your logo. If you've ever been in an accident, major or minor, you need to get some basic information from other drivers, witnesses, etc. This booklet not only guides you through first steps: what information to get, what details to copy, how to draw a sketch of the accident scene, but also gives you ample room in the booklet to do it. It becomes a permanent record of what happened. Useful for fleet vehicles and your own personal car. 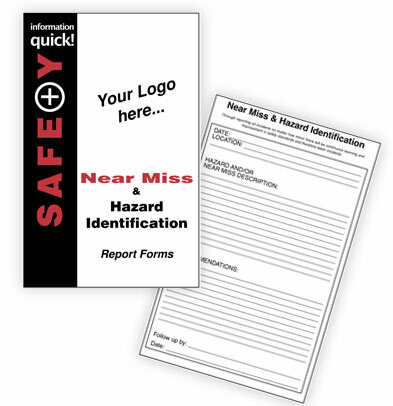 This booklet of report forms is an excellent tool for workers to report potential hazard and near miss accidents. Each booklet comes with 25 duplicate forms. By reporting and recording all incidents, no matter how minor, there will be continuous learning and improvement in safety standards and this therefore should result in fewer accidents.